Location: Excelsior Hotel is located in the upper central part of Golden Sands resort, 300 m from the beach and next to the park. Distance to the center of the town is 18 km and to the Varna airport – is about 30 km. 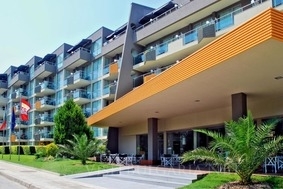 Nearby are located restaurants, shops, hairdressers, a bank, ATM and a regular bus connection to the city of Varna. Accommodation: The hotel offers Single rooms, 146 Double rooms and Double superior rooms, 54 suites. Bars and restaurants: Main restaurant, lobby bar and pool bar. All guests on all inclusive basis receive Bulgarian alcoholic and soft drinks. At the lobby bar - cakes with tee or coffee, and at the pool bar – snacks and ice cream. For children: For children between 4 – 12 years are taking care animators. The children are taking part in different games, competitions and entertainments. There is a playground and a wooden house near the pool, and built-in children`s pool in the swimming pool for adults. Facilities: Reception desk, paid safety deposit boxes, swimming pool with built-in children`s pool, outdoor Jacuzzi, sun umbrellas, sunbeds with mats, fitness corner and children`s playground.